NOTRE-DAME-DE-LOURDES, Que. 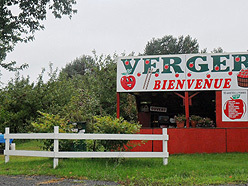 - A Quebec orchard is being accused of turning away a group of autistic youth because of their disability, something the property's owners strongly deny. It all centres around something that happened last Sunday in the small Quebec community of Notre-Dame-de-Lourdes, some 175 km northeast of Montreal. Seven autistic youth, under the supervision of eight adults, showed up at the R. Helene et Pierre fruit-picking orchard and were turned away. But the sides disagree on why they were denied access. "I was told that all along they felt the woman at the orchard was looking for a reason to not take them in," said Manon Champigny, who heads an autism advocacy group in the region. She was told that as the group was leaving the orchard, another group arrived and was welcomed. But the orchard's owner said it never happened that way. "That's wrong, there was no other group," said Pierre Boudreau. "We refused those young people because we were at full capacity, not because they were handicapped." He maintained his little orchard was overflowing with visitors that Sunday. "It was one of our biggest days," he said. "It was a beautiful day, there were people everywhere and kids were running every which way. It was manic." He also said the orchard hadn't taken a reservation for the group the week before, noting weekends had a 'first come, first serve,' policy. But at least one person unhappy with the treatment took to the web and the angry missive, along with the phone number for the orchard, spread quickly across social media. Within hours, the business was flooded with angry email messages. "Some people even said that if they lived nearby, I would be sleeping with one eye open," he said. "It's been a constant harassment."